ebbi modo di vederla e provarla a Firenze proprio al momento del lancio sul mercato, alla mostra "Exposer": avanti, forse troppo per quel periodo, inoltre costava un botto. Titolo: Apple invents the personal computer. Again. Testo originale: Apple invents the personal computer. Again. Introducing Lisa. The personal computer for the office. The personal computer revolution began with easy-to-use computers and ready-to-use programs that made it possible for just about anyone to master personal computing in 20-40 hours. Still, that's more time than many people can afford. Especially people who need personal computers most - executives, managers and small business owners. But now there's Lisa by Apple. Its hardware alone makes it the most powerful personal computer available: 32/16-bit MC68000 microprocessor. 364 x720 bit-map display. 1-Megabyte of internal memory. Dual 860-K disk drives plus a 5-Megabyte ProFile hard disk. It's the first personal computer that's easy to understand as your desktop. Because that's precisely the way Lisa works. So advanced, you already know how to use it. To use a conventional personal computer, you first have to program yourself by studying the manual and learning a complex set of computer commands that vary widely from program to program. Lisa replaces those commands with familiar pictures that work the same way from program to program. Files look like file folders. There's a calculator, stationery, even a wastebasket. So you can work with Lisa the same familiar way you work at your desk. To tell Lisa what to do, all you have to do is point to the appropriate picture using a clever palm-sized device called a “mouse”. As you move the mouse on your desk, the pointer moves on Lisa's screen. Lisa's extraordinarily powerful software takes care of all the details. So you can work with the system intuitively, right from the start. You can shape any kind of information you need — graphs, numbers, words, even pictures and see it all side-by-side. And you can transform that information in ways simply not possible with any other personal computer. You concentrate your effort on what you want done — not on how to get the computer to do it. It took 200 years to develop programs you can learn in 20 minutes. Lisa's software represents over 200 person-years of research, development and testing. But the sole objective of all that effort was to make the most powerful office tools immediately accessible. 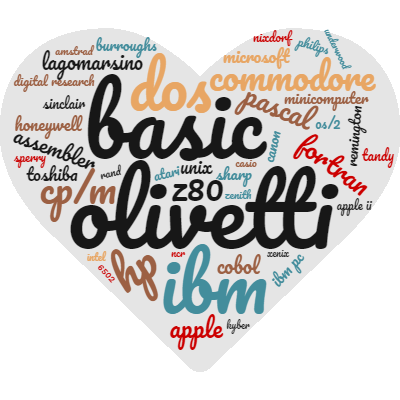 So you can begin producing useful work with a Lisa program in less than half an hour. LisaCalc electronic spreadsheet, LisaList electronic personal database, LisaWrite executive word processing, LisaGraph business graphics, LisaDraw design graphics and LisaProject electronic project management. Taken individually, each Lisa application is a powerful professional office tool. Taken together, they allow you to do things that simply weren't possible before. Because Lisa's applications work harder by working together - information can be "cut" from one and "pasted" directly into another. So you can effortlessly turn figures into graphs, paste spreadsheets into a report, and print it all out while you move on to another task. In the near future, with Lisa's designed-in networking capabilities, you'll be able to create a powerful network of Lisa workstations that can grow from one department to your whole organization. And you'll also be able to communicate with other computers with Lisa terminal applications, so you can access valuable commercial data libraries like Dow Jones News and Quotes or The Source or link with your company's own mainframe computers. Of course, the only way to appreciate everything Lisa can bring to your office is to experience Lisa for yourself. So give an Apple Personal Office Systems Dealer half an hour of your time. And he’ll give you 200 years of ours. Now that you know where the world's going, consider the advantages of getting there first. 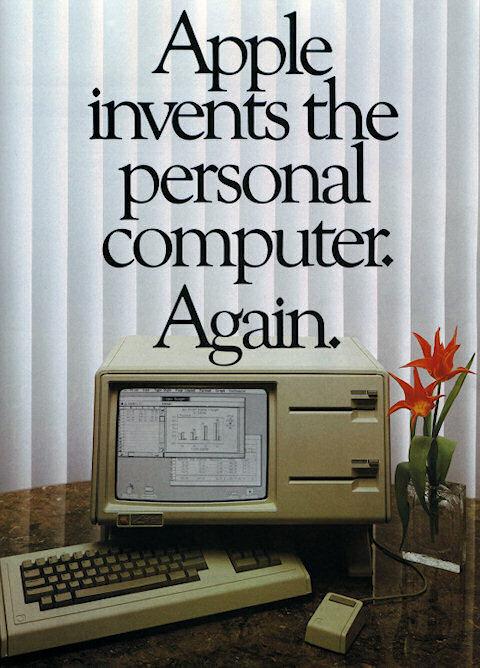 For more information on Lisa, the personal computer for the office, write Apple Computer Inc., Dept. L, 20525 Mariani Avenue, Cupertino, California 95014. Or, for the location of the authorized Apple Personal Office Systems dealer nearest you, or for information on our National Account Program, call 800-538-9696. Lisa. Since you already know how to use it, you might like to know where to find it. Testo tradotto: Apple inventa il personal computer. Ancora una volta. Vi presentiamo Lisa. Il personal computer per l'ufficio. La rivoluzione del personal computer è cominciata con i computer facili da usare e coi programmi pronti per l'uso che ha reso possibile per chiunque di padroneggiare il personal computing in 20-40 ore.
Eppure, questo è più tempo di quanto molte persone possono permettersi. Soprattutto le persone che hanno più bisogno di personal computer - dirigenti, manager e piccoli imprenditori. Ma ora c'è Lisa da Apple. Solo il suo hardware lo rende il più potente personal computer a disposizione: il microprocessore 32/16-bit MC68000. Risoluzione video 364 x720 punti. 1 Megabyte di memoria interna. Doppia unità disco da 860K più un disco rigido di 5 Megabyte. Ma la vera svolta è il modo in cui Lisa mette tutto quel potere nelle vostre mani: è il primo personal computer che è facile da capire come la vostra scrivania. Perché questo è esattamente il modo in cui Lisa funziona.